Everyone is welcome! Learn ways to share your faith and let your light shine! Experience encouragement in faith.Gain confidence to share Christ's love with others. Turning Small Talk into God Talk - Have you ever wanted to share your faith in Jesus, but didn't know how? What do I say? What do I even look for? How do I transition from a conversation about the weather to something greater? Please join us for this discussion of how to turn small talk into God talk. 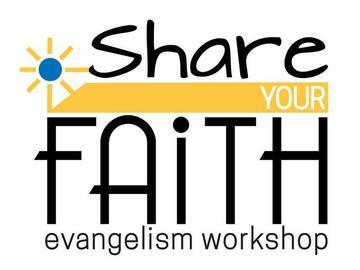 Discover Your Evangelism Style – Ever struggle with sharing your faith? Maybe you have been approaching it the wrong way. God has equipped each of us with our own style. In this session you will identify your God given personal evangelism style while gaining confidence in your approach to share His life changing message. Using Apologetics in Personal Evangelism - Christians are confronted with many questions (and accusations!) about the faith and are called to give a reason (apologia) for the hope they have (1 Peter 3:15). Yet the skeptic is also confronted with questions of reality. You have to do something about this Jesus character! Who is he? Is he truly who he says he is or not? We will discuss a few ways to carry on conversations in love in order to bring the skeptic to this fundamental question: Who is this man from Nazareth? Witnessing in the Workplace (Panel Discussion) – Many people spend a large part of their week among coworkers who need to know Jesus. Come learn from the experience of lay people who have navigated the opportunities and challenges of letting your light shine at work. Digital Outreach – A website with good navigation and intuitive design isn't enough. Social media posts with attractive photos and snappy text won't do it. Come explore the principles of online communication that every church needs to practice as we look at 5 congregations doing it well. Turn your church into an online superstar! Next Steps for Worship Guests – They actually came!! Now what? How to you move worship guests from attending worship to committed involvement? Hear how one of our local mission churches successfully encourages guests to take the next steps of Bible information class, volunteerism and beyond. Friendship Evangelism – People in the pew have the potential to be a congregation’s greatest asset in reaching the unchurched. Come learn about tools and resources your congregation can provide to encourage and equip your members to participate in spreading God’s word and inviting others. Using Schools for Outreach – This session will explore how schools and preschools can be used as arms of the outreach ministry of a congregation. Using a specific case story from experience, Pastor Huebner will share practical suggestions, examples, and strategies in this session. Reaching Out to People with Special Needs – 80% of the 10 million individuals in the United States with developmental special needs do not have any connection with a church. Participants will gain understanding of this vast mission field and how to reach and include them in our churches.